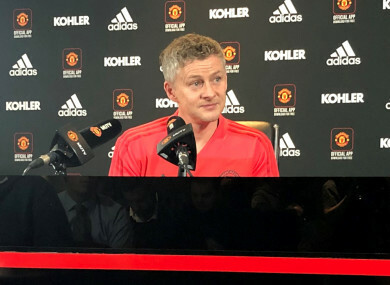 Ole Gunnar Solskjaer addresses the media at a press conference as the new Man United caretaker manager. THE NEW MANCHESTER United caretaker manager Ole Gunnar Solskjaer has said that he will draw from the teachings of legendary Old Trafford boss Sir Alex Ferguson. The 45-year-old was appointed to a temporary role at the club on Wednesday following the sacking of Jose Mourinho on Tuesday. He finds the club sixth in the Premier League, nine points behind the top four, and in grave danger of missing the Champions League next season. The Norwegian turned out at Old Trafford as a player for 11 years during their most successful era under Ferguson and netted the decisive goal in the 1999 European Cup final. Ferguson’s man-management was considered his major strength and Solskjaer says he has learned from it. “My job is to help the players and make them grasp the opportunity now because they all want to be a part of Man Utd and I’m going to be here to help them of course, help the team,” he told the media at a press conference. “It’s down to man-management. I had the best manager as a player and as a coach to learn how he dealt with people. It’s about communication. “Of course, I’ll sit down and speak to the ones who are not playing, what I expect from them. United’s campaign to date has been pitted with controversy away from the field, with Mourinho and World Cup-winning midfielder Paul Pogba embroiled in persistent sniping. Indeed, the 25-year-old was regularly found on the bench in recent weeks and did not even take to the field during last weekend’s 3-1 defeat against Liverpool, which proved Mourinho’s swansong. Solskjaer, by contrast, became a fans’ favourite at Old Trafford due to his loyalty to the club, despite often being reduced to the role of replacement. His first challenge will come against Cardiff City, the only British club that he has previously managed, in the Premier League on Saturday. Email “'I'll speak to the ones who are not playing...I don’t think anyone has been on the bench more than me'”. Feedback on “'I'll speak to the ones who are not playing...I don’t think anyone has been on the bench more than me'”.